RBTH presents a selection of views from leading Russian media on international events, featuring a review of the Ukraine-EU summit in Kiev, plus a report on Russia's appointment of a new special representative to the contact group on Ukraine and news that NATO plans to double the size of its Response Force. Online newspaper Gazeta.ru reviews the Ukraine-EU summit in Kiev on April 27. The website notes that high hopes were held for the meeting, but it did not end in any major breakthroughs. Ukraine convinced the EU to send a diplomatic mission to monitor the situation in the Donbass region of eastern Ukraine, but failed to obtain the consent of European countries for the supply of defensive weapons and deployment of peacekeepers. The monitoring of the implementation of the Minsk peace agreements was assigned to the OSCE mission, Gazeta.ru adds. This is consistent with the interests of Russia, which opposes the presence of European peacekeepers and stands for the strengthening of the OSCE's role in the implementation of the Minsk agreements, the website notes. 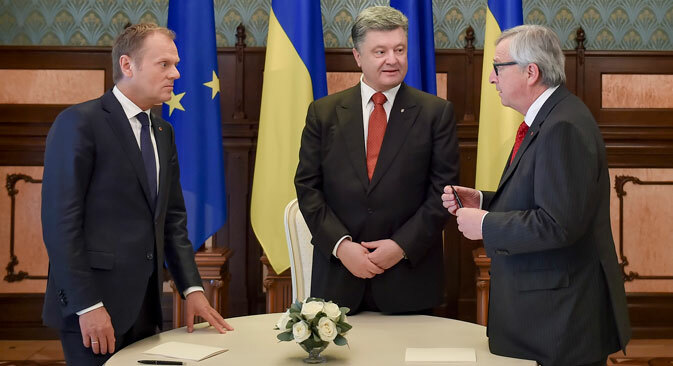 According to experts, the refusal to make concessions to Kiev on the issue of arms supplies is related to the EU's growing irritation over the actions of the Ukrainian authorities. The head of Russia’s Presidium of the Council on Foreign and Defense Policy, Fyodor Lukyanov, describes the EU's reaction not as irritation, but as despair: "It is impossible to abandon Ukraine, it should be supported. But the scale of support will only be such as to maintain its capacity to function, as long as it remains unclear what the Ukrainian state will be like." In his comments to Gazeta.ru, Russian political analyst Oleg Bondarenko said that Ukraine failed to receive from the EU the most important thing – the introduction of visa-free travel. According to the summit's outcome agreement, the parties only confirmed their intention to "achieve a common goal" on the issue. "But Europe does not need migrants from Ukraine – it has enough migrants from other countries," said Bondarenko. Business daily Vedomosti reports that Russian President Vladimir Putin has signed a decree appointing former Russian ambassador to Syria, Azamat Kulmukhametov, as Russia's special representative in the trilateral contact group formed to resolve the situation in Ukraine. He will take over from Russian Ambassador to Ukraine Mikhail Zurabov. The work in the contact group is becoming more intense, a source in the Russian Foreign Ministry has told Vedomosti, and it now requires a specially-assigned person. Unlike Zurabov, Kulmukhametov is a career diplomat, who served as Russia's ambassador to Syria at the height of the crisis. The technology of conflict resolution is more or less known, and if a person has tried his hand at it, he is likely to be able to apply it in respect to Ukraine, even if he has a "different background," former Soviet and Russian Deputy Foreign Minister Anatoly Adamishin told Vedomosti. In addition, the Syrian experience was one of the last cases in which Russian interaction with the West proved a success, said Adamishin. The Moskovsky Komsomolets tabloid daily writes that the NATO leadership intends to double the size of its Response Force to "adapt to new risks." The head of the alliance, Jens Stoltenberg, cited Russia as one of them, writes the newspaper. “We are facing a dramatically changed security environment in Europe,” the NATO head. According to him, the Russian side has broken international law through its "aggressive actions against Ukraine." According to the newspaper, the size of the NATO Response Force is expected to be increased more than twofold – from 13,000 to 30,000. Stoltenberg also made a mention of a 5,000-strong quick reaction force, which is currently being created. TROIKA REPORT: Can Moscow and Tehran form their own 'NATO'?